Late last week, a prominent Swaminarayan Hindu Temple in Louisville, Kentucky, was defaced and vandalised. Mandir volunteers say they found hate-filled religious phrases and black crosses. They also saw that a knife had been stabbed into a chair and several doors had been broken. The area has a growing Hindu community and Kentucky recently elected its first ever State Representative from the Hindu faith, Nima Kulkarni (District 40). In a message over the weekend she said: "Thank you to the hundreds of supporters who cleaned, painted, and stood in solidarity with the Swaminarayan Temple today." "I am overwhelmed by our community's response to this incident, and know that this has made us stronger." On Saturday hundreds of people from the local community came to the Mandir to express solidarity and offer support to the local Hindu community. 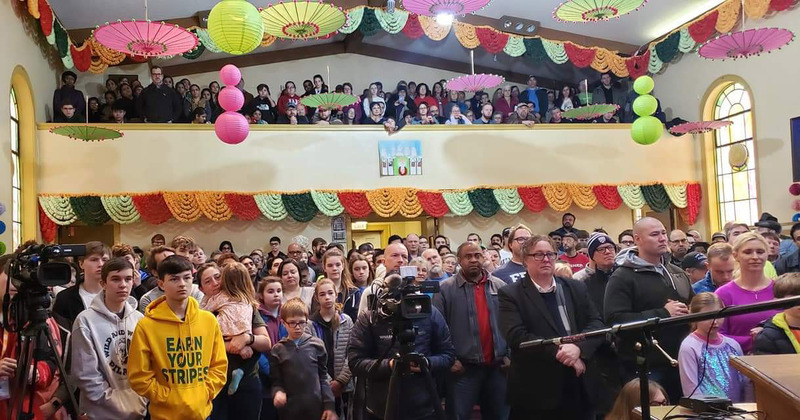 A spokesperson from the Mandir said: It was ensuring to see all faiths, ages, our elected officials, and the good members of the community to come out and represent what Louisville is all about. The devotees of the temple were filled with joy and reinsured (sic) that we belong in this community and that we can reside together as brothers and sisters." "Thank you for all the prayers and love. We felt it and it meant a lot. We will be able to come back to our house of worship with peace of mind." The city Mayor Greg Fischer had also called the vandalism a "cowardly and unacceptable act" and urged the city to help clean up. Louisville-based Muslim Americans for Compassion had organized volunteers too. "We are so happy and so proud of Louisville’s community of compassion! Hundreds turned out for today’ community clean-up at Swaminarayan Temple..." said a statement afterwards. A teenager has also been arrested after being accused of the crime, say Louisville Metro Police Department.